Today marks one year since the publication of my first academic paper in the Orphanet Journal of Rare Diseases (OJRD), and with several other papers currently at various stages of completion, I thought I’d take a quick look to see how my first has fared over the last 12 months. The paper was written while I worked for the TREAT-NMD Alliance, an international translational medicine research network connecting scientists, clinicians, patients and patient organisations, and the pharmaceutical industry in the neuromuscular field. In rare diseases, finding appropriately equipped clinical trial sites and patient populations is often tricky, and the Care and Trial Site Registry (CTSR) is of the resources TREAT-NMD provides to overcome these challenges. The paper gives an overview of the CTSR and analyses the data it held on Duchenne muscular dystrophy (DMD). The OJRD is an open-access journal, with a current Impact Factor of 3.96, and with papers being free to download and re-host elsewhere. For that reason, the access data below is an underestimate: a Google Scholar search currently indexes “11 versions” hosted in various places, and only data on BioMed Central websites are tracked, despite being indexed in other bibliographic databases and the full-text being included on Springer Link. The publisher itself provides basic metrics, and as of 22nd October 2014 the paper had been accessed 3183 times via PubMed Central and is therefore “Highly Accessed”. PubMed Central also includes the paper’s Altmetric score of 21, though one has to click through for full details and the score in context. 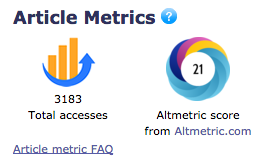 Although the utility of Altmetric scores is debated, especially their ‘social media’ component, they allow comparison with other tracked articles. The paper is apparently the fifth-highest scoring article in the OJRD (98th percentile); is the top scoring article amongst those of similar age (± 6 weeks); and is in the top 5% of all 2,446,094 articles tracked by Altmetric. The article has also been cited in 2 other papers, both written by people with whom I previously worked. 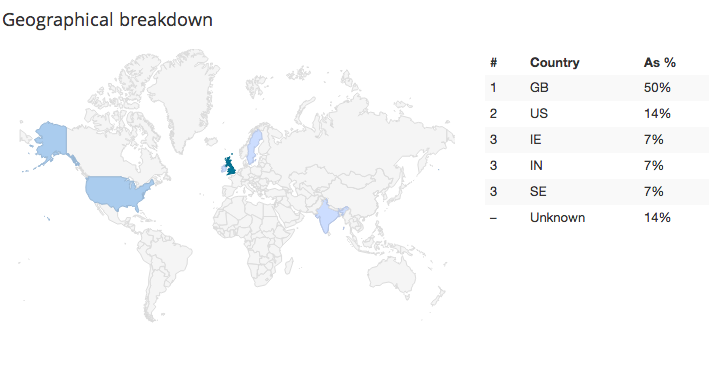 Well, it is nice to know that the paper has been accessed (and hopefully read)! More seriously, this points to the fact that the jury is still out on whether “accesses” or Altmetric scores are good indicators of the utility of an academic paper to others. Citations, rather than other metrics, are the main way in which academic prestige is accumulated, and so from this perspective the paper is not a particularly high flier! However, the subject matter of the paper also mitigates against this: it does not describe a new gene or other discovery, but a tool which may be of use to the neuromuscular field in conducting trials, so I would not necessarily expect a particularly high citation count. I suspect metrics are rather more useful, however, in terms of raising the profile of research and beginning to understand your readers. This is an ever present concern given the focus on “impact” by funding bodies such as Research Councils UK. In turn, this may have real-world effects: in the case of my paper, by raising awareness of the utility of the CTSR in clinical research, it may help with the planning and conduct of clinical trials. Since I wrote the paper, the CTSR has expanded to included neurodegenerative diseases as well as neuromuscular diseases, and now has an integrated Phenosearch tool to allow “match-making” amongst registered researchers with undiagnosed patients – ultimately improving the knowledge in the rare disease field, and hopefully improving the treatment available to patients. For me, that is the most rewarding part of having published this paper.